As the sharing economy is taking over, delivery drivers have an indirect relationship with the companies that employ them, making it possible for them to be fired on the spot. While that is a normal employment situation in the United States, Europeans are more inclined and likely to have a fixed work contract that in many countries makes it difficult for employers to fire them immediately. Andres Georgi, 41, experienced this firsthand when he was fired from the food delivery service Deliveroo, a British company operating in numerous European countries. During a food delivery to a gay couple in Berlin, Georgi told me he noticed both an LGBT flag and a European Union flag next to each other in the customers’ hallway. “I like the LGBT flag, but I don’t like the EU flag,” he told the man who opened the door, and said he thinks, “Brexit is a good thing.” He added that he thought Germany was too influential in the EU, and that other countries suffered from that. The man didn’t look too pleased, but no discussion ensued, and Georgi quickly forgot about the incident. “I just told him that it’s probably not the right time to discuss something like this,” Georgi told me. “That was the end of the story.” So he thought. But it wouldn’t be, by a long shot. The man who had opened the door was the partner of Redfern Jon Barrett, a writer and activist, whose website describes himself as a “polyamorous, pagan giant.” Barrett was not happy with the exchange, and tweeted his displeasure at Deliveroo. The tweet has since been deleted and the account protected, but it was captured in a screenshot by the German blog Ruhrbarone. “The @Deliveroo delivery guy just went on an aggressive nationalist rant when he saw the EU flag in our hallway,” Barrett wrote. “We are gay immigrants who live in Berlin. 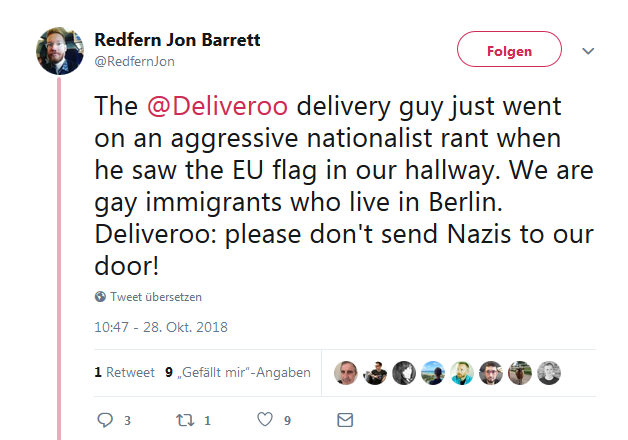 Deliveroo: please don’t send Nazis to our door!” Notice that here he automatically assumes that agreeing with Brexit or casting shade on the European Union equals being part of a mass-murdering political party. Deliveroo apologized in response to his tweet, and asked for more information so they could investigate. Deliveroo subsequently fired Georgi from their driver system, citing unprofessionalism. In the past, Deliveroo had accused Georgi of harassing a customer, but it turned out that he was wrongly accused and the case was dropped internally. Georgi showed me the emails that Deliveroo sent him, which disclose that their HR department is also not convinced that Barrett’s story is correct, but are seemingly afraid of the potential backlash. The only thing Deliveroo says that can be supported is that talking politics with customers isn’t advisable for delivery drivers. I reached out to Barrett to get his response to the incident. The story has been reported in Germany and the United Kingdom, but Barrett has not publicly commented. Three months before the incident, Barrett submitted a short story called “Delivery” to a literary magazine, which he himself described as “a sticky, slippery story about fast food and revenge.” This short story is about a fast food delivery boy who discovers his partner is cheating on him on a delivery and gets revenge. Four days after the real incident with Georgi, the short story was published by the magazine. Self-fulfilling prophecies seem to remain real. Georgi told me he is not a Nazi, and was actually a part of Germany’s Antifa movement in his youth. The two, while both authoritarian in nature, are fierce political competitors. Today he identifies as neither left nor right. He’s difficult to categorize, since he says he’s not entirely on board with capitalism (even though it is much preferably to anything totalitarian), and is staunchly pro-Israel and against radical Islam. Overall, Georgi seems like guy who loves conversation and political and philosophical debate, which in a city as open-minded as Berlin is not rare. You can make up your own mind on Georgi’s stances, but he certainly shouldn’t have been fired for them. His stance that Germany is too influential in the EU has actually been echoed by the German left for years. This situation has devastated the delivery driver. Being called a Nazi in Germany is a much stronger accusation than it would be in the United States or the UK, and as a father of three children he faces an uphill financial battle. He still works as a delivery driver, but given the dominant position of Deliveroo, he can only get jobs at much smaller companies, which pay far less. Georgi has set up a crowdfunding campaign for those who wish to support him in these difficult months prior to Christmas. There are real-life consequences to people who believe anyone who disagrees with them is a Nazi. And that reality isn’t pretty. In another year, finding 21 Democrats willing to support pro-Israel legislation should have been a cakewalk. However, 2019 is not any old year. 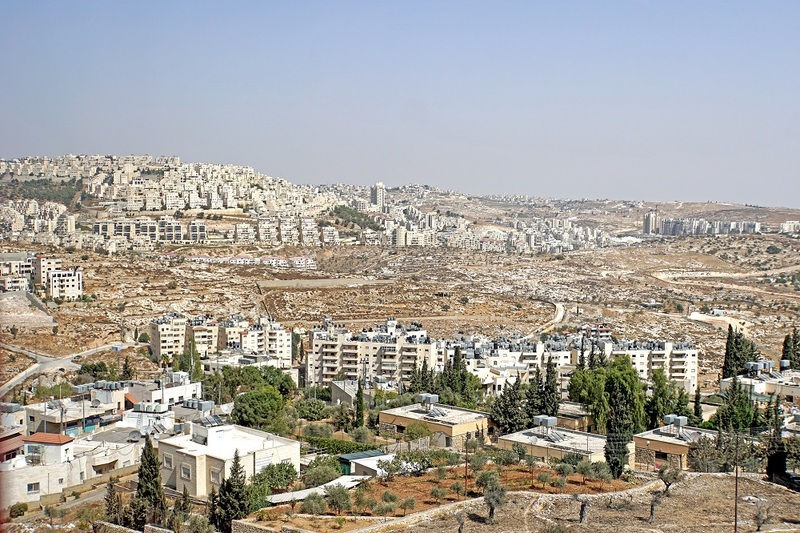 Israel has the moral right to annex all of the West Bank, for a plethora of reasons. Israel’s right to exist is non-negotiable and it has a right to unilaterally apply Israeli law over its nation-state. It might not soothe the soundbites, but Donald Trump is correct about Theresa May and Brexit. The British Parliament’s betrayal of the British people is now complete. The commission’s call for unity is especially timely and poignant because Italy is ready to jump on China’s ‘Belt and Road’ initiative, despite mounting security concerns from the EU. A recording leaked from a recent Labour Party meeting reveals the depth of the party’s depravity, and the challenges it will likely face as it attempts to correct course.